Although The Chronicles of Narnia is a children’s book, it’s good to see that director Andrew Adamson has not toned down the original story by the great C. S. Lewis and the movie adaptation of the sequel to the Lion, the Witch and the Wardrobe which is quite faithful to book and the original vision of C. S. Lewis. This current incarnation of The Chronicles of Narnia is only set a few years after the first story, however for Narnia, several hundreds and hundreds of years have passed. For Narnians, time passes differently than that of the human world and the children who first walked through their uncle’s wardrobe are now experiencing the ramifications of their initial visit. As Peter, Susan, Edmund and Lucy are “summoned” back to Narnia, they uncover the devastating effects that mankind has had on the Narnians. To compound the situation, the humans have banished Prince Caspian who is the only human capable of bringing peace to this troubled world. Once again it is up to sons and daughters of eve to end this conflict, assist Prince Caspian vanquish the vile General Miraz and for Lucy to find the fabled Aslan. Needless to say, the four children face an uphill battle, however this is what the magic and spirit of this series is all about and I must admit that I thoroughly enjoyed this sequel and what made this even more enjoyable was the high definition presentation of Blu-ray. Presented in glorious 1080p, the world of Narnia truly shines on Blu-ray with extremely sharp picture quality and vibrant colours. Where this presentation does amaze is through the special effects that look extremely realistic and go hand-in-hand with the real-world actors. 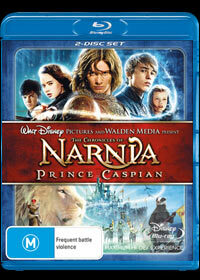 Match that with some great special features and The Chronicles Narnia – Prince Caspian is a worthy Blu-ray purchase that contains a variety of twists and turns which will leave you clamoring for more. Thankfully another movie is in the works which will neatly complete this amazing trilogy.